They are an elite fighting force led by a pair of twins that feel each other's pain. They are the Imperial Guards of Cobra. They wear red leather, not caring that the 80's were three decades ago. 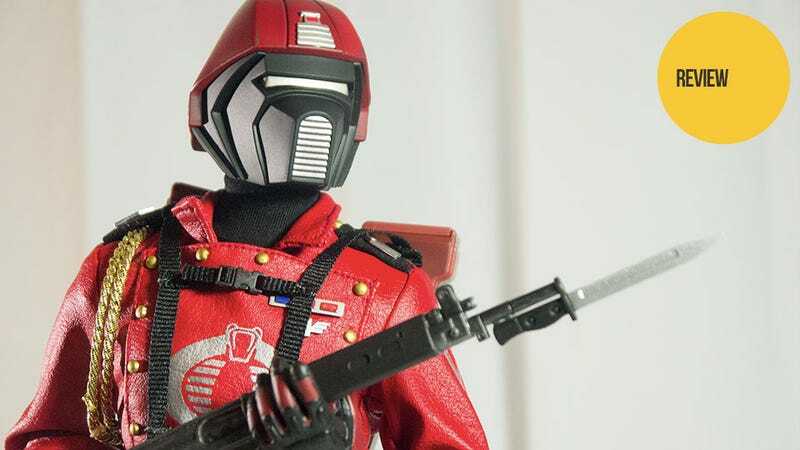 They are the Crimson Guard, the latest in the sixth scale line of G.I. Joe figures, and they are incredibly fine. Lt. Falcon is fine with all his gritty realism, and Zartan is pretty subdued, as a master of disguise must be, but for me it was always the more outrageous G.I. Joe outfits that got my blood pumping and my mom-hem-tugging fingers working overtime. Give me a guy that'll walk onto the battlefield wearing brilliant crimson, gold braids and a face mask—because anonymity is important at that point. His garish Michael Jackson circa "Beat It" getup translates incredibly well into real-ish life. While I wouldn't wear it myself (hell yes I would), the Crimson Guard cuts a striking slender figure. If you turn his head just so (see below) he can pull off downright menacing, though only for short periods of time. The Crimson Guard also incorporates one of my favorite features in the accessory-heavy adult action figure market—equipment storage. You'll still be left with four hands, two feet and an extra head, but the rest of Ceegee's gear either fits onto his person or in the groovy red backpack he totes around. Utility is important and often sadly overlooked in the adult collectible market. Again, easily my favorite figure in the sixth scale G.I. Joe line so far, at least until Tomax and Xamot show up. The Crimson Guard Sixth Scale figure retails for $140, and is available from Sideshow.